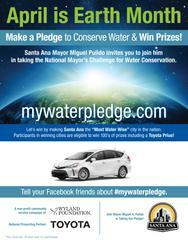 To participate, residents enter online at mywaterpledge.com, and then make a series of online pledges to conserve water on behalf of Santa Ana. Cities compete in the following population categories: (5,000- 29,999 residents, 30,000-99,999 residents, 100,000-299,999 residents, 300,000-599,999 residents, and 600,000+ residents). Cities with the highest percentage of residents who take the challenge in their population category are entered into drawings for hundreds of eco-friendly prizes, including home improvement gift cards, home irrigation equipment, and a Grand Prize Toyota Prius. The challenge also features additional resources for residents to take their commitment of conservation even further, from regional water and energy resource issues to cost-saving tips at home.